Chicago's reputation as one of America's finest food cities is thoroughly deserved. It is, after all, home to chef Grant Achatz's celebrated Alinea and some 25 other Michelin-starred places. The thing is, when you read 'Chicago', you didn't think 'Grant Achatz's parmesan balloons', did you? No. You, like the rest of the world – including Achatz, probably – thought hot dogs and deep-dish pizza. It's the latter that's brought me here, on a pizza pilgrimage with, appropriately, the Pizza Pilgrims, brothers James and Thom Elliott. We'd discovered deep dish was a massive, cheese-covered gap in our collective knowledge so, here we are, primed to dive into the city's leading pies, with a view to James and Thom recreating something deep dish-influenced back in London. And, as with all best laid plans, that's going to fall apart in a matter of hours because deep dish is a fraction of the story. The real story is how Chicago is actually the most pizza-obsessed place on the entire planet. We start as we mean to go on, dropping bags at our hotel – The Godfrey, a comfortable boutique hotel in the central River North neighbourhood – and heading for food. On the drive in we've passed Portillo's, which has our driver waxing lyrical about Chicago's other classic: the Italian beef sandwich. He's not wrong. It's gravy-dipped and delicious, ditto the 'chargrilled Maxwell Street-style Polish' hot dog. As we sit plotting our deep dish consumption, the couple at the neighbouring table lean over. Is Gino's East on our list? No. 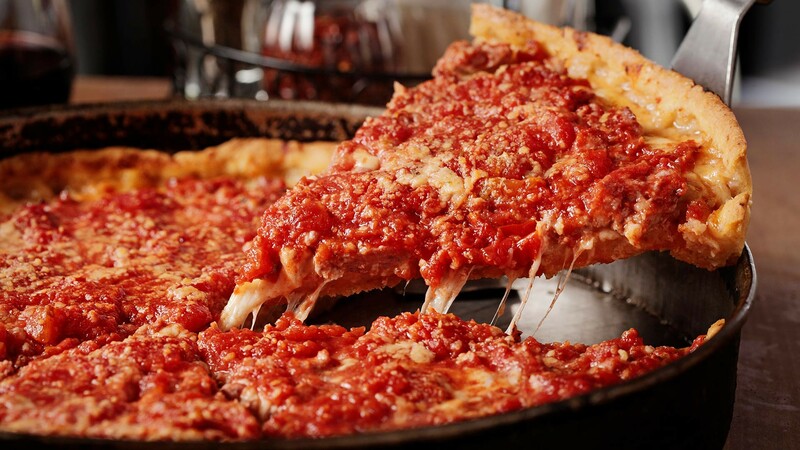 "Best deep dish in Chicago," they assure us, adding "It's only five minutes' walk away." We look at the remains of the sandwiches, and then at each other. "Yeah," says James. "This is happening…"
And it does. And it's a revelation. Mistakenly – probably based on terrible British frozen pizzas of the 1980s – I expect a thick base covered in several stone of melted cheese. I'm wrong. Well, about the base, not the quantity of cheese… The base is thin, crisp and buttery. It's the filling that's deep. The sausage has a good fennel kick, the vegetables have bite, the encasing tomato sauce is rich. It's crunchy, unctuous, cheese-smothered and bloody great. "That's proper," says Thom, admiringly. "But neither of them has any idea at all how to make pizza! So they find an Italian guy, Rudy Malnati Sr. Ric is saying pizza's a thin, small snack, but Ike's from Texas, and wants it bigger and better. That's how Rudy creates deep dish, at what's originally called Pizzeria Ricardo. 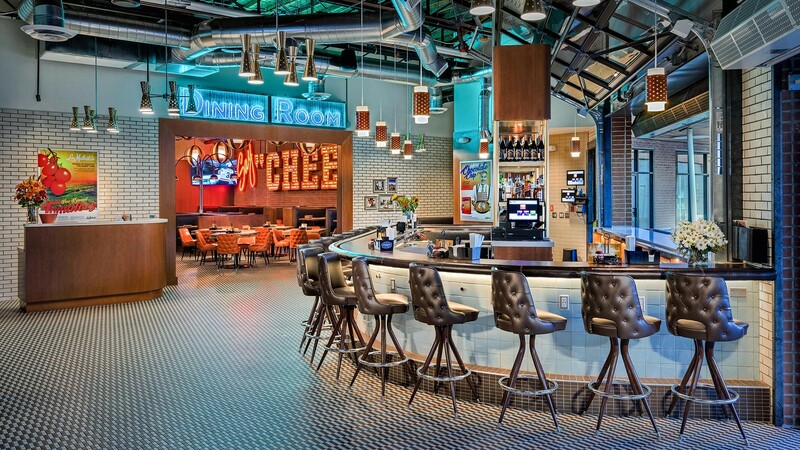 When they open a second location in 1955, that becomes Due and the original becomes Uno." The tale extends from there, too. Gino's East starts in 1966 with a chef poached from Uno. Rudy Malnati stays at Uno all his life, but his son Lou leaves the business in 1971 to found his eponymous restaurant, which Lou's son Marc has since turned into a chain of 46 sites around Chicago plus one in Phoenix (and, bizarrely, one very short-lived one in Newcastle Upon Tyne). We tick these places off our list and more. We pay homage at Uno's (a little run-down, but decent pies) and admire Lou Malnati's high quality, hand-prepped, mass catering. Here, sausage is applied in small pieces across the base, giving pork in every bite, and the gaps allowing the sauce to interact with the base. 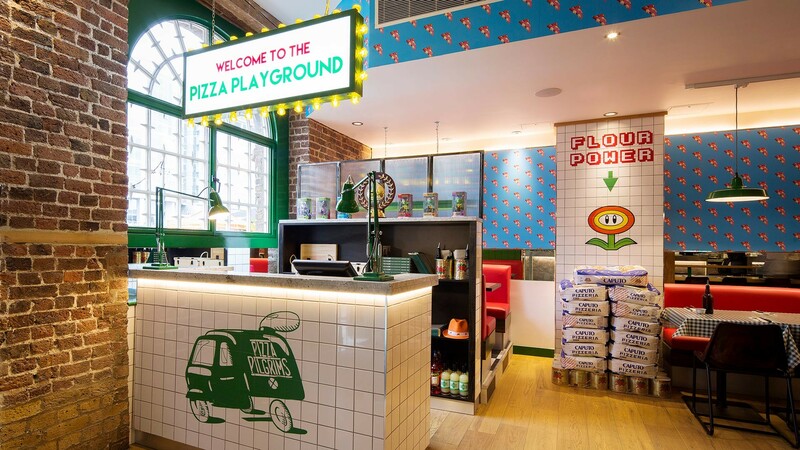 (Their signature dessert – a chocolate chip cookie 'pizza' – is also excellent: "We're so doing that in London," declares James). At The Chicago Oven Grinder & Pizza Co, the serve is pizza pot pie. There's a much-watched YouTube clip of this: a cheese-lined bowl, whole mushrooms, meat blitzed into the sauce, topped with a pizza crust and turned out at the table. "It looks like something giving birth," whispers Thom. It's arguably more lasagne than pizza, but it's definitely tasty, a success beyond just the novelty presentation. At the boisterous Pequod's, pies come with a "halo of caramelized crust" – the menu's words, not mine – and it's immense. The base is light and crispy, the deeply flavoured sauce hides still crunchy pieces of pepper and mushroom and nuggets of fennel-heavy pork. "I love that sausage," says James. And then we hit the other pizzas. When people hear we're on a deep dish tour, they'll always proffer their favourite option. When they discover our Chicagoan levels of obsession, they reveal their absolute favourite pizza spot – and it's never deep dish. Deep dish, we're told regularly, is great – but more than one per year is pushing it. We've done five in 48 hours and receive looks of, well, probably absolute horror. But we're going to pretend that it's deep respect. Perhaps the most recommended spot is Piece, for its own-brewed beers and Newhaven-style pizzas (nope – me neither). It turns out it's a drier, thinner descendant of the traditional Neopolitan-style. "I grew up in Newhaven, Connecticut," explains Piece founder Bill Jacobs. "You have to go there for pizza – it's some of the best in the whole world. And I wanted to have it right here in Chicago. "Every pie's hand-formed. You pull it, you don't toss it, and that's what gives the all-important chew and crunch. It's not about quantity, it's about having the right ratio of sauce, cheese and toppings." Piece's popularity is easy to understand. It's terrific – particularly a bacon and clam number. As to whether it's the best, we'll maybe bow to Paulie Gee's words of wisdom: "There's no such thing as 'best pizza'. There's only 'favourite pizza'." How do you pay tribute to the greatest pizza city on earth? It's a headscratcher. "Or we could do a calzone special,” says James. "Masses of sauce and cheese, and ‘Frankenstein’ elements of all the places we liked?" Some things in life are certain, however. It won’t involve pot pie – "that was so wrong," says Thom, "although it was quite hypnotic." Foodism readers will be the first to know – look out for news on foodism.co.uk and @FoodismUK (plus @PizzaPilgrims and @DineHard). And there WILL be warmed cookie dough pizza. Obviously. 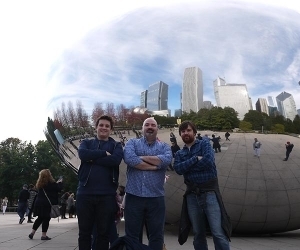 Three months on, we've shed our deep-dish weight and James, Thom and I are still trying to make sense of the trip – and to work out the most effective tribute. "That was pure gluttony," laughs James, "but what a place to be gluttonous. And the range! All those guys who aren't Italian but just love pizza. No quest for authenticity, just what tastes delicious." Thom wholeheartedly agrees. "I really loved it, it's a great city." We start picking through a list of food consumed. Seeing it written down is slightly alarming. "We packed a shitload in, didn't we?" laughs Thom. So chaps, I ask, favourites? "Pequod's was great," says James, "really good pizza." "That crust was amazing," agrees Thom. "And that sausage…"
"And Piece was great," adds Thom. James agrees. "Those are the innovative places. Deep dish is great but it's kind of stuck in the 1960s. The innovation is the Newhaven, Coalfire, the Roman…"
James makes a valid point. There isn't much innovation in the world of deep dish but, actually, we all agree it doesn't matter. If you put one in front of us now, we'd inhale it. That 'new' school of pizzas is pushing things forward and long may they continue – but there's undoubtedly room for both in Chicago. And, calorie intake permitting, there's still no school like the old school.